The treatment of the spine is one of the most important aspects of a Thai Massage treatment. The spine is our pillar. It is the central axis of both heaven and earth. Therefore we address this Yin/Yang polarity with both Dynamic and Static Massage Techniques. We live through this perpetual Yin and Yang manifestation. Life is movement and rhythm and is one of the fundamental principles of Life. It allows evolution! It is this cyclical change in-between rest and movement that generates forces. And in the same way, the non- respect of our inner rhythms leads us to a disease state. Along with our spine we not only have the fluids of our central nervous system but we also have energetic centers which relate to emotional, physical and spiritual aspects of our life. These swirling wheels of energy correspond to massive nerve centers in the body. Each of the seven main chakras contains bundles of nerves and major organs as well as our psychological, emotional, and spiritual states of being. Since everything is moving, it’s essential that our seven main chakras stay open, aligned, and fluid. If there is a blockage, energy cannot flow. We will address each chakra with the aim of bringing back balance and ease into our being. Since mind, body, soul, and spirit are intimately connected, awareness of an imbalance in one area will help bring the others back into balance. This course will be understanding the patterns of in-breath, out-breath, giving and receiving, dynamic and static movement for more fluidity and precision in our work. In this course we will learn how to go with the flow and move between movement and stillness…and at the same time have freedom in our movement. Having already the basic techniques and principles of Thai Massage, we will go deeper in our understanding of the flow…the Sacred Dance. How we can adjust, move and dance with another body, without getting “stuck” in positions, keeping precision in both line work and acupressure points. We will explore more acupressure points and learn how to use more the elbow, knee and foot. We will also learn how to then come to a still point and listen deeply to what the body is telling us we need to do. We will learn focus and precision in the static part of the massage so that together they may complement each other as the polarities of Yin and Yang do. Chakra 2: Swadhistan – Water – Fluidity – Movement – Grace – Flow – Dance – Harmonics – Releasing old wounds. Chakra 5: Visuddha – Sound – Voicework – Singing – Communication – Expression – Dynamic movement. Chakra 6: Ajna – Intuition – Truth – Clarity – Meditation – Cranio pulse. Chakra 7: Sahasrara – Infinity – Divine guidance – Angels – Kriyas – Rebirth – Energy bodies – Pranayama kosha. Full massage exchange to free all the chakras and the spine. 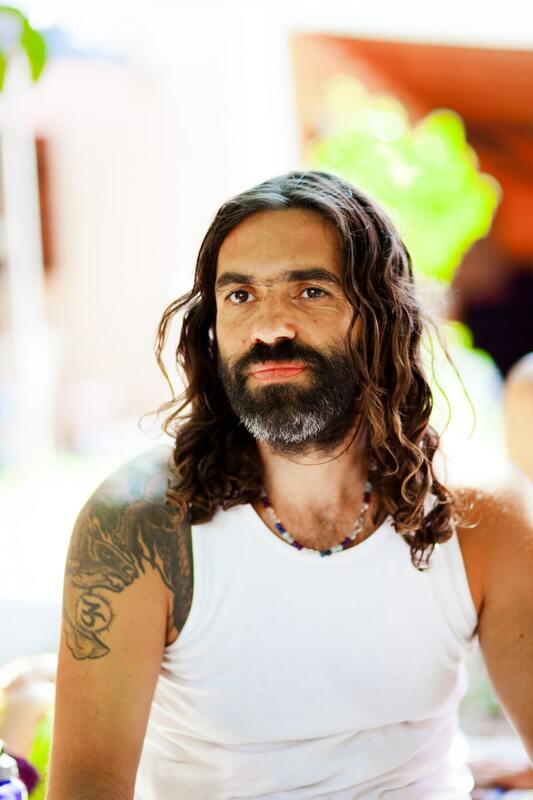 Krishnataki, originally from Greece, has been teaching Thai Yoga massage, yoga and qi gong since 1998 having lived and studied in Thailand and India. His first gateway to the East was through the inspirational teachings of Tai Chi master Tew Bunnag which led him down the path in search of his true spiritual essence. He is now a senior massage teacher of the Sunshine Network, and has trained with Thai massage masters Pichet Boonthume, Chayuth Priyasith and Asokananda and has a Sivananda Yoga background. He is passionate about organic farming, Chinese medicine, cooking and nutrition and incorporates aspects of yoga, meditation and Qi Gong into all his courses. His base is at Sunshine House, where he leads a variety of retreats aimed at igniting the spiritual, healing flame that lies dormant in each and every one of us, however he still spends time travelling abroad to teach and also study, where possible. He is renown for his unique, fun-loving and passionate way of teaching as well as his generous spirit, hot hands and delicious home-made recipes. When he is not teaching, he is with his three beautiful children or soaking in hot spring waters. The course is taking place at the West of Berlin, in the heart of Charlottenburg, is Spirit Yoga Studio. The special feature of this studio is the integrated SPIRIT SPA with day spa, two saunas and a wide range of massages. For bookings click here: Registrations for the event.